Campers pitched at our Beadnell Bay campsite are rewarded with stunning sea views over the dramatic Northumberland coast in one direction and the distant Cheviot Hills in the other. If you’re looking for a seaside escape, you’ll find it here. The campsite is very spacious and offers level pitches. The magnificent dunes and golden sands of Beadnell Bay, just minutes from our campsite, are excellent for bird watching. 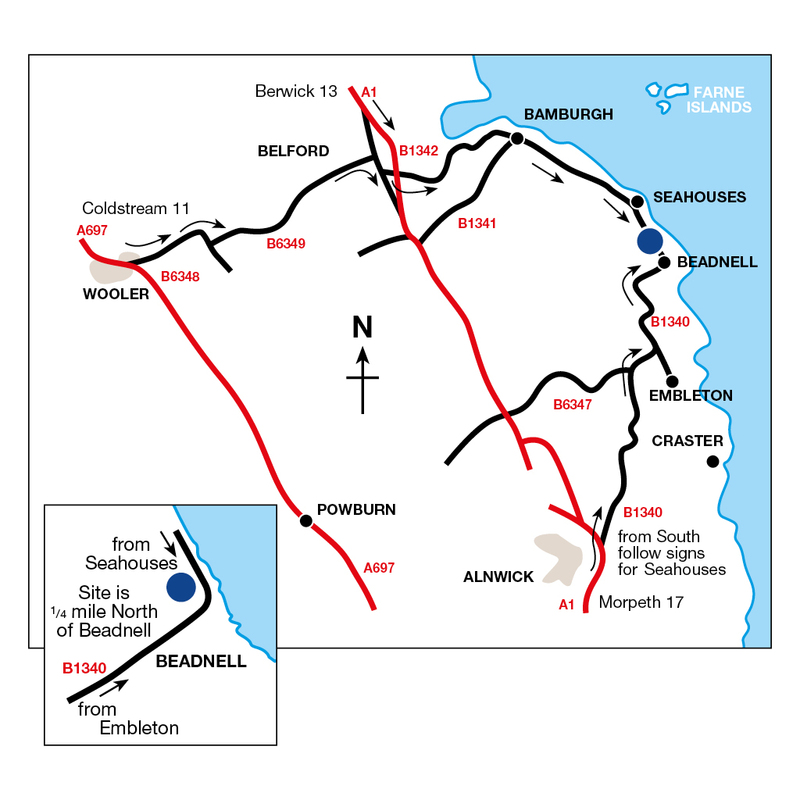 Walkers too will enjoy beach walks to nearby Beadnell and Seahouses. Catch a boat from Seahouses to the beautiful Farne Islands where you will be able to observe more beautiful birdlife and colonies of seals. If you’re into cycling, the Coast and Castles and National Cycle Routes pass the site. Northumberland has a number of fascinating castles and fortified buildings waiting to be explored, including medieval Alnwick Castle and impressive Bamburgh Castle right on the coast. Swallow Fish Ltd in Seahouses supplies local produce including crab and seabass. Robert Carter & Sons in Bamburgh sell local meats, cheeses and pies. Members of the club can receive 20% off at The Craster Arms on presentation of your membership card. Steel pegs are required for tents due to winds and gazebos can't be erected. Please note that a 25 metre electric lead is required for both hard standing, and grass with electric pitches. Shower available for those with wetsuits. Filler hose needed for Motorhome Service Point. This campsite is exposed to sea breezes and gusts of wind. The use of internal heating or cooking apparatus, using combustible fuels such as wood or coal is restricted at Beadnell Bay. Barbeques are allowed as per Club policy, but should be carefully monitored to prevent sparks, smoke and disturbance to others. A beautiful sandy cove on the Northumberland coast, Beadnell Bay also hosts a variety of water-sports including, kitesurfing, windsurfing and sailing. Reputed to be haunted by the ‘Pink Lady’, Bamburgh Castle is one of the oldest forts in the country. The original fortification was destroyed by the Vikings in 993AD before it was rebuilt by the Normans. Marooned off the North East coast and only accessible by causeway at specific times of the day, the Holy Island of Lindisfarne is a small yet mighty piece of Northumberland's heritage. Second only to Windsor Castle in size, Alnwick Castle is a magnificent stately home. Alnwick featured in Downton Abbey and Harry Potter. Enjoy this quiet site in an area known for its beaches, birds and castles.